We recently looked at how Amish use turbines to harness the wind and create power. But what about when they need to do the reverse–generate a little wind of their own, say to keep cool in the hot summer months (remember those)? 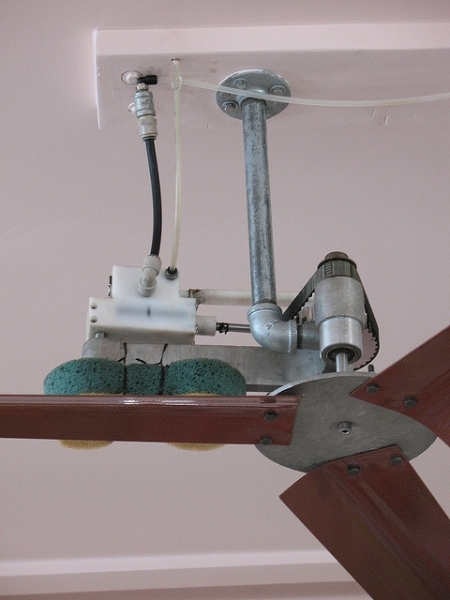 You may have seen Amish-engineered ceiling fans before. They are common in Amish shops. You can see one in action here, driven by pneumatic power. The photo below was taken at an Amish store in the Wayne County, Indiana Amish settlement. If you compare it to the one at the link, you’ll notice this fan seems to have a bit of a twist to it. Can you tell what is going on here? Wetted blades drop air temperature through evaporation. I can’t figure out the fan, but I wish you a Happy ew Year, too. One clear line is air coming into the coupler and black hose. The other is a water supply that the same valve and piston assembly (white block) that turns the fan, pumps water onto the sponge that wets the fan blades. Principle is that it takes heat to vaporize water, so the evaporation of water on blades lowers air temperature. Low humidity is required for efficiency. Air driven, water mist, ceiling fan. As the fan blades go around hits the wet sponge and and puts a mist of water in the air. Well, I’m not that clever I’m afraid Linda 🙂 I figured it had something to do with cooling, but I think my main intent was to get one of the mechanically smart readers to better explain to me what was going on here (thanks Paul). Give me hope for the hot climate in MS! Happy New Year Erik! Happy New Year, Erik and the rest of the Amish America Community. Having you all in my life made 2012 wonderful. God bless you in 2013. Looks to me like the ceiling fan version of a swamp cooler type of air conditioning, i.e. blowing air across water to cool the place down. It’s surprisingly effective, too. Congrats on that shop for engineering their own version! On the fan, I think, as someone who still has a television set that still gets PBS, I think that this illustrated fan is a whole heck of a lot safer than the flame driven fan shown several times this year during reruns of “Antiques Roadshow” (at least reran on the Buffalo, NY affiliate). I sort of wish my family kept the antique plug in fan we had, but we kids destroyed that sometime in the 1990s, it was a neat looking little fan, but got too hot to cool, kind of like the fire thing on A.R. I am wondering if all these shows being shown on TV about the Amish is effecting the communities at all. Althought I know the Amish are people to and are open to make mistakes like all the rest of us. I tend to think of them as more proper than the English community. The shows are kind of shocking, like Amish Mafia. I do know of an English woman that was a close friend and driver for an Amish family. She took them to the doctor, the stores etc. and had even bought a car seat to go in her car for the baby. Well the father in law would do things behind the families back, when the woman would drive him places he would say “just don’t tell my family”. Well then the end came when the Amish man made , how can I say, made a very bad “move”, the English woman said that’s it, I’m not putting up with that. She had to end her friendship with the family. It’s to bad because the young mother really needed a driver. and a friend. I do know that was just one person, my family lives near the Amish and works with them on a day basis. And really enjoys their company. Anyway I was just wondering about the effect of the TV shows. Deb, I doubt they affect the community much as the Amish do not watch television. Perhaps some are being approached by reality-show producers, but it seems like most of the people in these shows are not baptized Amish but rather those who have already left the community. I think when we don’t know a group really well, there is a tendency to either put them on a pedestal, or to assume the worst about them. In the end, people are people. I like this blog – as well as books such as An Amish Paradox – because while they are sympathetic to the Amish, they also show us that these are a people with problems, challenges, and varied ways of dealing with the broader world — not unlike all the rest of us! My family has known and worked with the Amish for many years. They are wonderful people, and yes they are open to the same challenges we are, and also more challenges. I wouldn’t think that it would affect them directly yet because they don’t see TV but it may start making the rest off the world treat them in a different way. So it could start making a difference in their life and the way they are treated by the English. I hope not because we really don’t know how much of reality TV is real. But I also know that people sometimes do believe what they see on reality TV. I see there are still a few short hours left before 2013, so I’d like to join others here in wishing each and every one a happy, healthy, prosperous (within reason) 😉 New Year. I thought that was a sponge up there, but I wasn’t sure if was meant to cool the air or clean the blades! 🙂 Clever! I recall (before we had air conditioning in our old Chicago frame two-flat, Ma setting ice cubes in a pan in front of the blower of the space heater in the dining room (no central heating or AC, just a couple of space heaters in each flat). Then I’d lay right in front of it, on the floor, hogging the somewhat (!) cooler air. I’m guessing I felt cooler as much from laying on the floor as anything else, but it was fun (as a kid). Erik, you, too, are appreciated. Thanks for continuing this blog. It feels like a “letter from home” whenever I see “Amish America” in my e-mail box! A lot of the other readers’ names have become familiar as well, making it feel like a friendly, interesting “neighborhood” in which to “hang out.” I look forward to reading it (and “meeting” new people here) as often as I can. Can anyone explain a bit more about the technology behind this wind-powered fan? For example, is this ceiling fan being powered “live” from a spinning windmill outside? Or is it possible to store up windmill energy as compressed air, then release it as you need it to power ceiling fans or workshop equipment? Not actually storing windmill energy, just changing wind to mechanical energy. Pressure vessels store it. Water wheel, steam engine, or a number of ways to drive an air compressor is used for drills, blenders, mixers… most anything electrical can be air powered with a turbine. There are also gas or diesel powered air compressors for back up. If shared between more than one farm, deep well plastic pipe underground increases the volume of compressed air storage space. Pressure tanks can be added at each point of use. Volume is the key. Very close to steam power, much safer. The advantage of steam is that steam continues to expand when released unlike compressed air. Paul, neat to learn about this. Do you know about any websites that explain how this is done on a small scale, household or farm basis? The electric used to compress the air to drive the pictured fan would be many times the cost of operating a electric motorized fan. But it’s more efficient to use wind, water or animal power to directly turn a compressor than to generate the electric for a electric motor operated compressor. Thanks Paul for your insights into this. Compressed air seems to be a great way to store up wind power for whenever you need it later on. The Cottage Craft Works website is very interesting — and the air-powered appliances are certainly expensive. It mentions that some appliances are converted to air power at an Amish run shop. That would be fun to see. The sponge simply collects dripping water from the piston air outlet! When pressurized air expands (like in the piston driving the crankshaft of the fan) it dramatically drops in temperature (simple application of thermodynamics – the power has been “spent” (translated) into kinetic energy of the fan). The cooled air now has a much lower “dew point”, meaning that the air has lost some of its ability to hold H2O molecules in a non-droplet state … essentilly “rain” is forming when high-humidity air is cooled down by expansion. This is a common problem with all pneumatic equipment – only the solution is … err … uncommon but certainly functional.